Healthcare organizations are continuing to consolidate, with complex regulations eliminating competing companies and enabling larger firms to merge, grow their market power and implement operational efficiencies. Central to meeting the business strategy for many companies are through custom software and consolidation of different business units on to single platforms for electronic medical records (EMR). The EMR industry mirrors the consolidation in healthcare, with key players being forced out of business or merging with their competitors. On the patient care side, electronic health records (EHR) systems reflect greater diversity and innovation, with individual patient histories combined into digital archives that permit deeper analytics and data mining for physicians and healthcare providers needed to care for individuals and groups. The healthcare software, particularly with development of mobile apps that tightly tie to medical databases, facilitate care in a way that has become increasingly more sophisticated. We see seven key trends that will make this approach even more powerful moving forward. Perhaps the most pervasive trend in EMR software is cloud computing. Software as a service is changing the way we use computers, and that change has reached the healthcare industry as well. Prior to cloud-based solutions, a small urgent care facility might need $40,000 or more in order to afford the necessary software and equipment. Now that facility can consume an online service instead. The initial cost is low, clients often subscribe on a monthly basis and users can access that system from nearly any smart display, including their workstations but also their smartphones and tablets. Data integrity was one of the earliest goals of healthcare software. The notes scrawled by doctors on patient files were often illegible to others. With electronic data entry, information became more accessible and less prone to errors and ambiguity. Incomplete data, however, remains a problem. Automation, which requires integration, helps to overcome it by adding the appropriate information to the system as it becomes available. In other words, eliminate the need to enter EHR data by having a system that automatically extracts data from the resources that medical professionals use organically. A common design approach we follow at Ayoka is to build rule-based software that hides or show HER questions based on clinical insights from patient data. An important way that EHR providers are evolving is access. No matter how large the datasets and sophisticated the tools, the usefulness of EHR software is limited by access. A major reason why cloud computing is the top trend is because it provides the infrastructure for that remote access. A doctor who has an EHR account through a hospital can log on through a computer at home or a private practice. 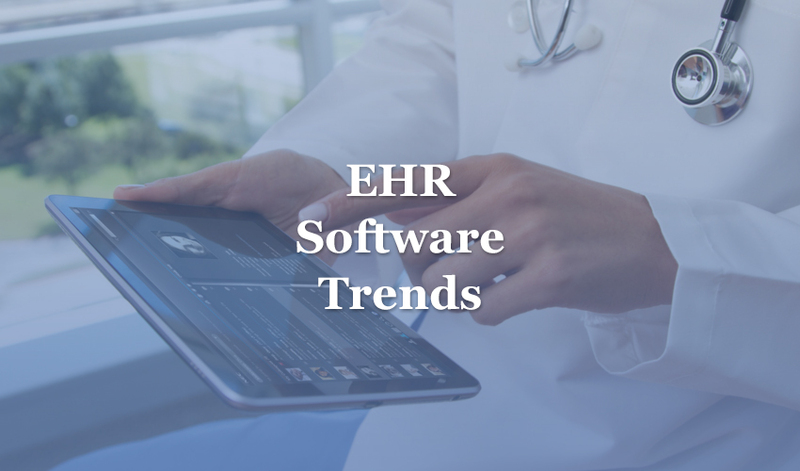 EHR services are becoming device-independent as well, which means that medical professionals don’t have to worry about whether the software developer makes an app for their particular phone. Many Ayoka mobile apps are built in technology that efficiently compiles to both Apple (iOS) and Android devices. Telehealth, also known as telemedicine, is an innovation and trend in health care that allows doctors to treat patients who wouldn’t otherwise have access to that care. For instance, physicians increasingly use video conferencing to treat seniors who have limited mobility or to perform adjunctive screenings. The natural evolution of this trend will be to incorporate virtual reality and even robots, but even the most basic form of telemedicine wouldn’t be possible without a EHR solution coupled to a centralized EMR system. EMR software puts all of the data needed to treat a patient at the fingertips of a medical professional who’s likely meeting this patient for the first time. Patient access is mandated one of the most intriguing trends in healthcare software, and it reflects a changing philosophy in the industry. In the past, it hasn’t been unusual for hospitals to restrict patient access to medical records. Patients have a legal right to this information, however, and there may be no one better suited than them to update personal information or note discrepancies. Through online portals, patients can access lab results, review notes from doctors, receive patient education and so forth. Stage 2 Meaningful Use Guidelines requires a patient portal (e.g. web page) from which patients can “view, download, and transmit” their medical data. In addition to mandating this capability, the Guidelines require 5% of patients to use the patient portal. The 2017 Electronic Health Record Incentive Program-Stage 3 raises this percent to 25%, but allow healthcare organizations to meet that participation by providing an API. The landscape of electronic privacy and security is experiencing ongoing transformation. Historically, EMR software was a local solution, so security concerns were relatively low because breaches required physical access. This is no longer the case, so a prevalent trend in EMR systems that provide Web-based access is more thorough HIPAA compliance and the implementation of bank-level security and encryption methods. There’s also better employee training, refined protocols for hospitals and other clients to follow and response teams on standby in the event that a data breach does occur. Many organizations and professionals within the industry were slow to accept EHR software. Now, it’s impossible to imagine a future in which all medical facilities aren’t integrated into some sort of healthcare software network. Medical professionals have simple access to EMR software or EHR solutions whether they’re in the halls of a hospital or on-site at a remote location providing care to patients.